HST Overview - Go Navy Go! So many amazing superlatives apply to the USS Harry S. Truman that it’s hard to remember them all. Perhaps its most obvious feature is its size. At left, the HST dwarfs the “specks” that are the other ships in its strike group. Click on this photo to see a short video of our descent onto the HST. At 100,000 tons, the Nimitz-class carrier (the HST is one of ten) is the world’s largest warship. The flight deck is 1,092 feet long (almost as long as the Empire State Building is tall) and 257 feet wide. Two nuclear reactors drive the ship at 30+ knots (the actual speed is classified). 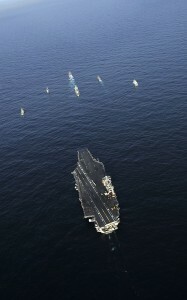 Despite their size, the Nimitz-class carriers are the fastest displacement-hull vessels in the world. They cost $4.5 billion each. The nuclear reactors must be refueled every 20 to 25 years. The ship can cruise more than 2 million miles between refueling.5,000 to 6,000 Navy personnel crew the ship, including the ship’s company and the air wing. Average age: only 19 years old. What a boatload of 19-year-olds can do, and what the extraordinary Navy organization enables them to do, is simply astonishing to this “seasoned” 52-year-old.